When it comes to tires, that's all ya gotta do. Ask. 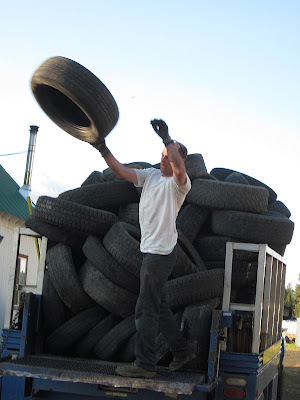 Everyone wants to give you their old tires! Now that word has gotten out, we've been buried in the dirty (beautiful) old things. I'm getting them faster than I can process them. I'm trying to lay out the garden as ordered and regular as I can. 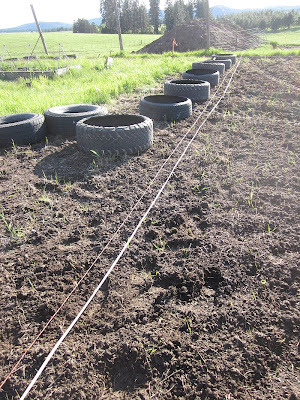 To this end I'm using measuring tapes and strings to line everything up. 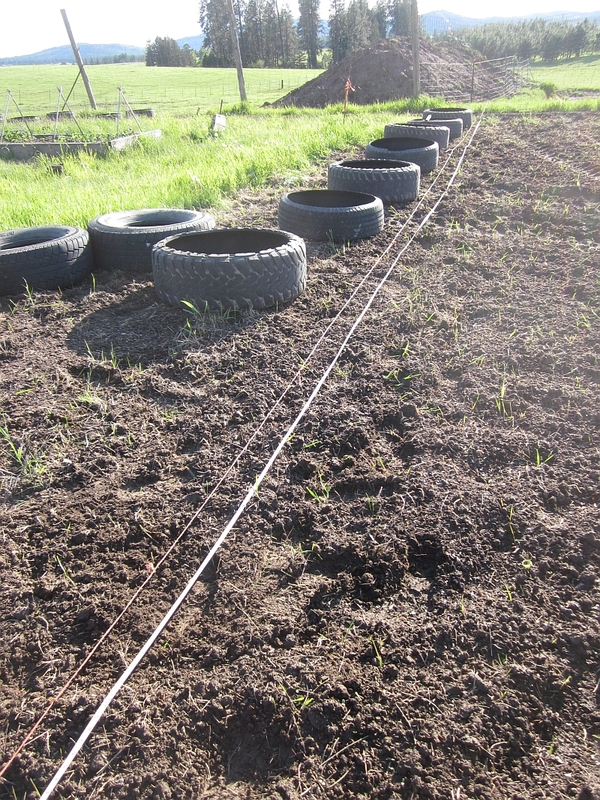 These widely-spaced tires along this narrow strip of garden will be for viney plants such as pumpkins, watermelons, cantaloups, etc. I've put newspapers and wire mesh beneath each tire and they're now ready for planting. 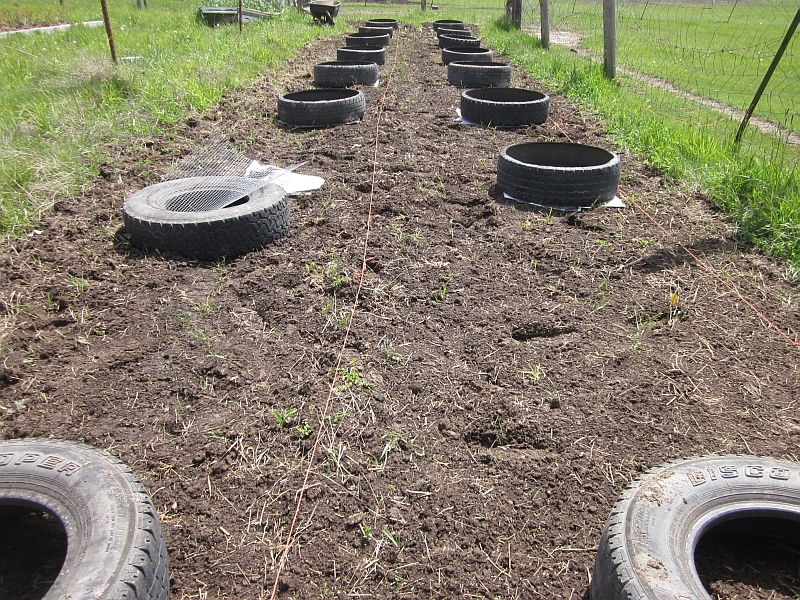 I lined up a series of huge tires along a string to be used as herb beds. In this respect, measuring tapes are very handy. Then two evenings ago, we got a call from our friend Jack, who works at a tire store. 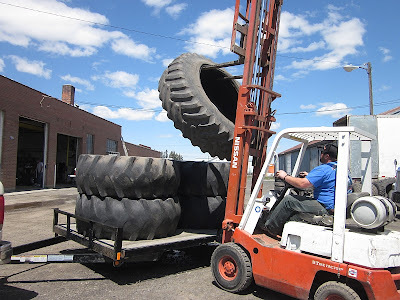 He was on his way with the company truck to deliver a load of seventy tires (!). 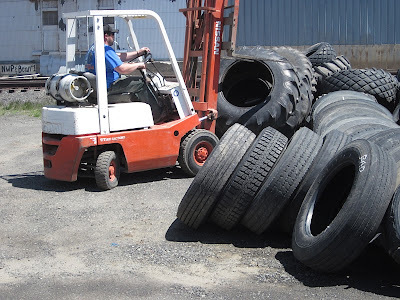 Needless to say, his company is thrilled that we can use the tires, since otherwise they have to pay to have the tires recycled and/or processed. 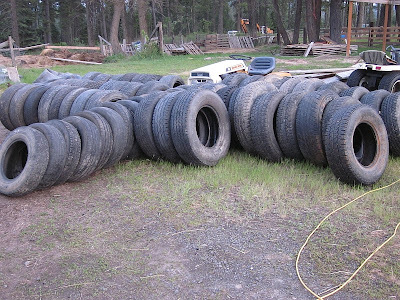 Jack said they'll give me as many tires as I could possibly want. And then some. See? 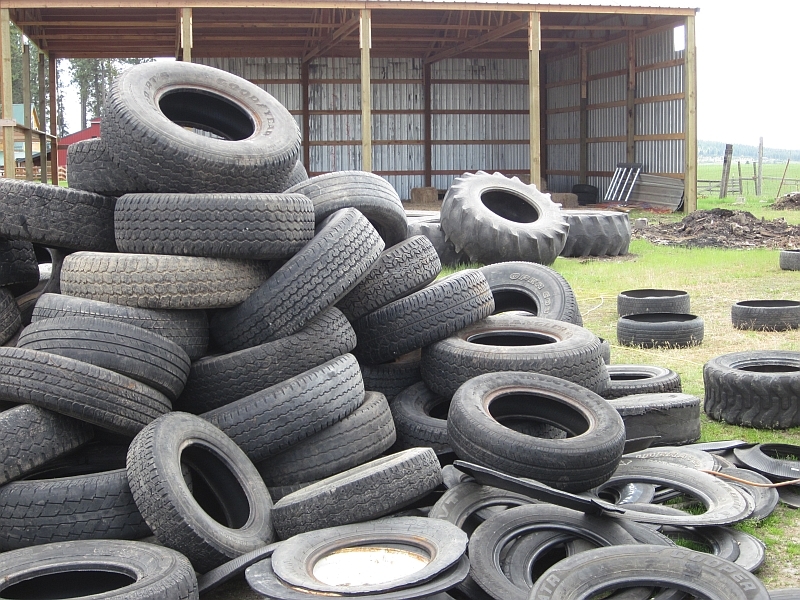 A veritable mountain of tires. Then yesterday, Don and I borrowed a neighbor's trailer and drove to a nearby town that has a tire dealership specializing in tractor tires. 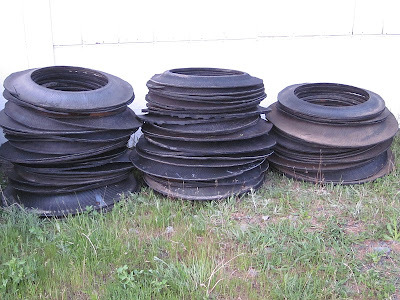 They had dozens of huge old tractor tires they would be delighted to get rid of. 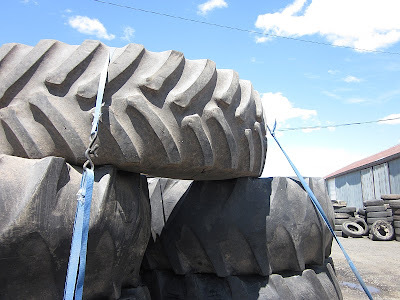 "Dozens" would be a bit much -- these babies are huge and are correspondingly harder to manage than smaller tires -- but we'll take some. It's hard to appreciate the size of tractor tires until you're up close to them. 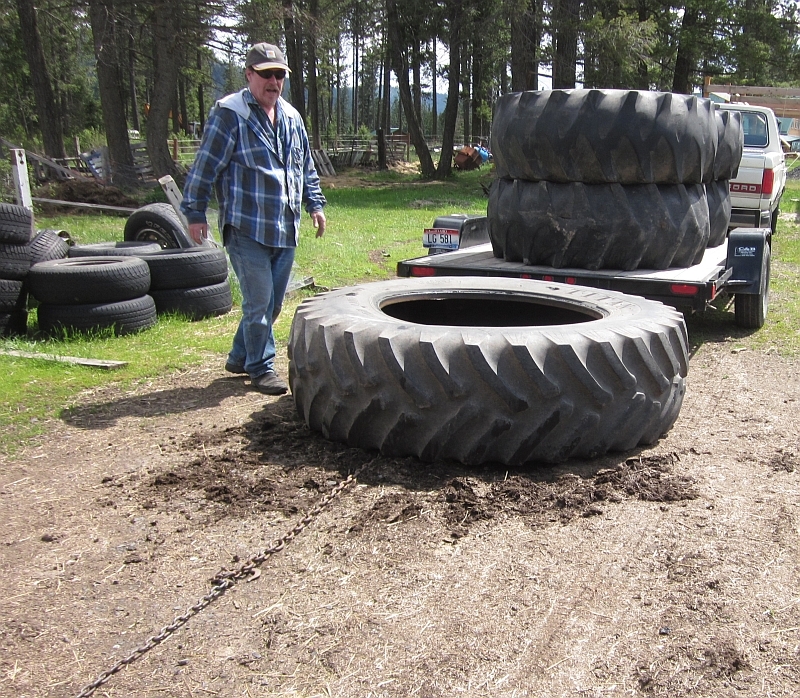 Don estimates they weighed about 300 lbs. each. The fellow used a forklift to load them onto the trailer. 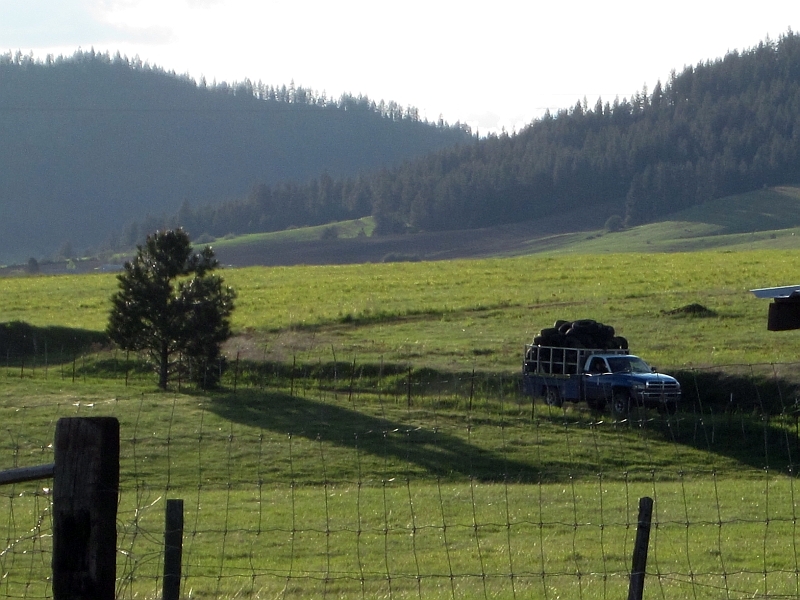 ...which we strapped down firmly before creeping home with our groaning load of 1500 lbs or so. We chained up and used the car to drag each tire off the trailer. 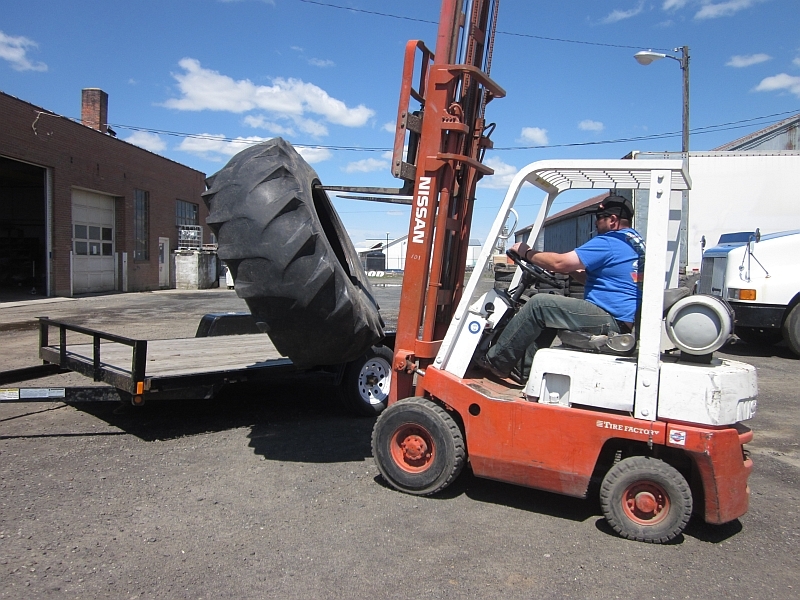 Don and I were then able to hoist each tire on its side and roll it out of the way. Okay, time to get these things under control. I started by trundling 27 of the biggest truck tires into the garden. These I left uncut and merely stacked by the potato tires, to be held in reserve until it's time to start building the stacks. That reduced the pile by about one-third. Then I sorted the remaining tires into small, medium, and large sizes. 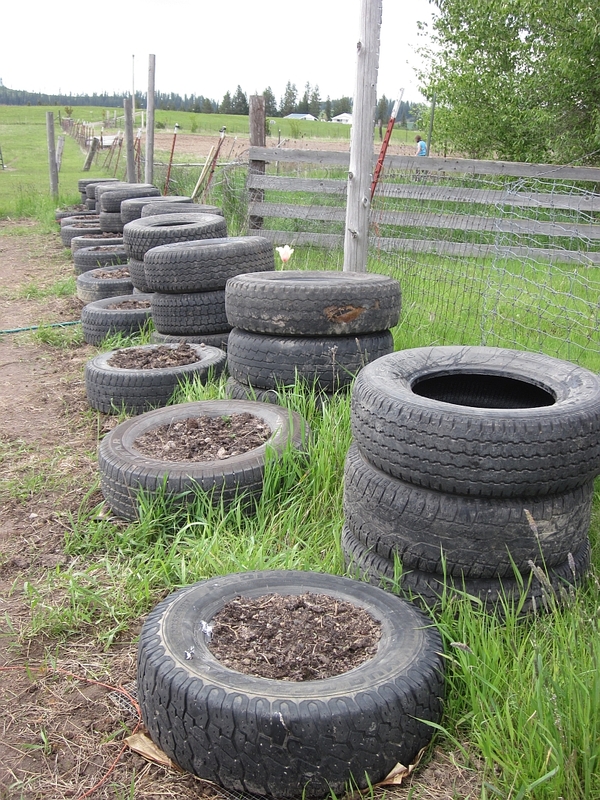 There were a few small odd-sized tires mixed in, so I'll cut these and use them for flowers. I stacked the cut-off sidewalls out of the way. We have some ideas for using these discarded parts. 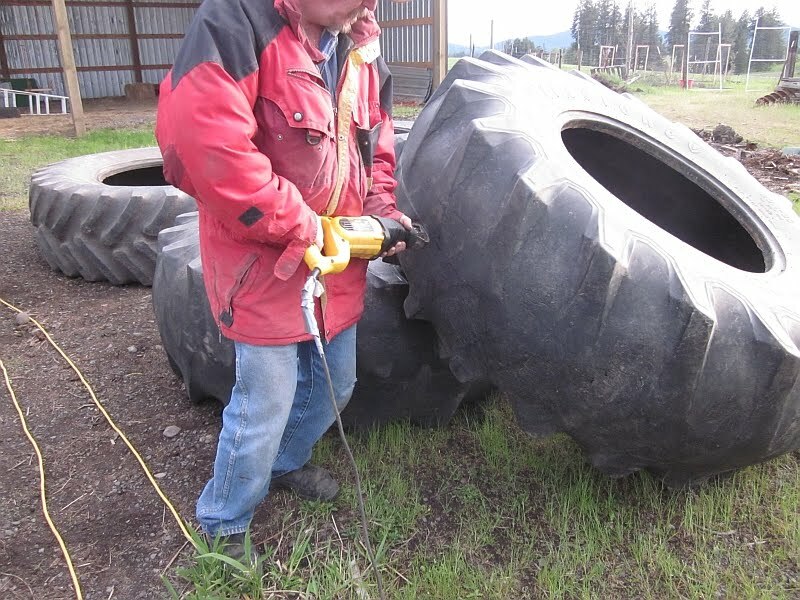 Meanwhile Don tried his hand at cutting one of the tractor tires. It was hard going, but he finally succeeded. The cut was wavey-ier and more jaggety than he wanted, so he said next time he'll use a chalk string to mark it so he can get a cleaner cut. 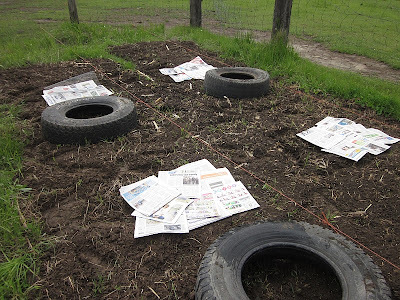 Next steps: cutting out sidewalls, moving the tires into the garden, lining with newspaper and mesh, and filling. (Oh, it that all?) I'm encouraged that for all the work I have to do this year, I'll have a whole lot less work to do next year. Who ever said farming wasn't hard work??? 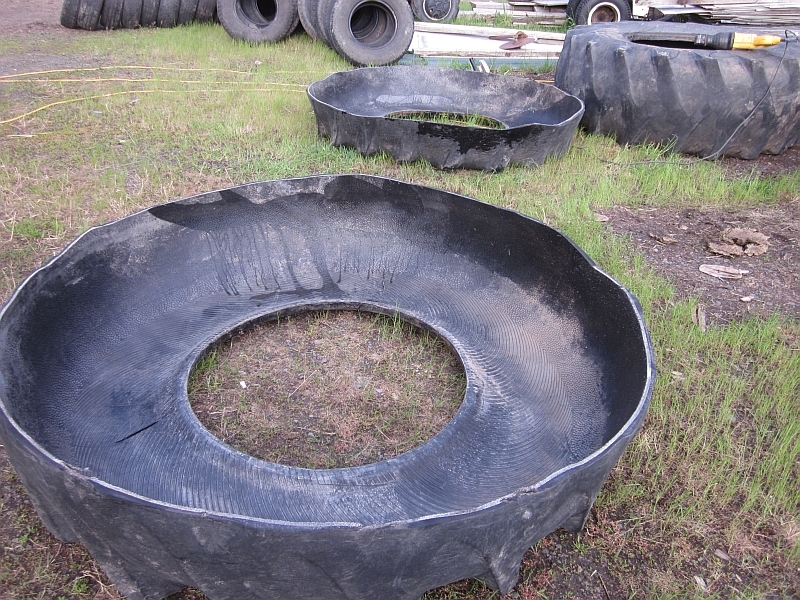 Good way to recycle tires - you may have started a trend! 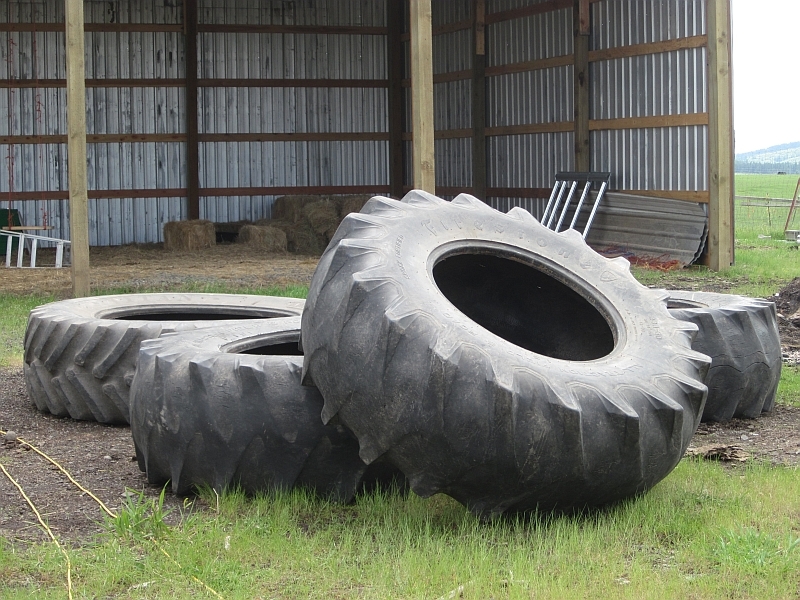 Ya know... That half tractor tire got me thinkin'. 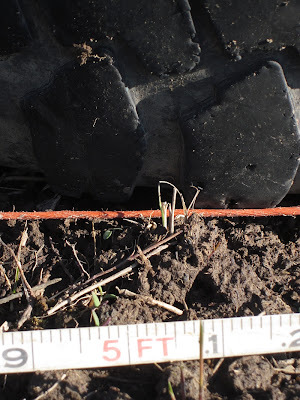 Would it work to cut the sidewall out of a tractor tire, seal up the opening in the remaining sidewall and use it as a water source for the critters? I don't know about chem. 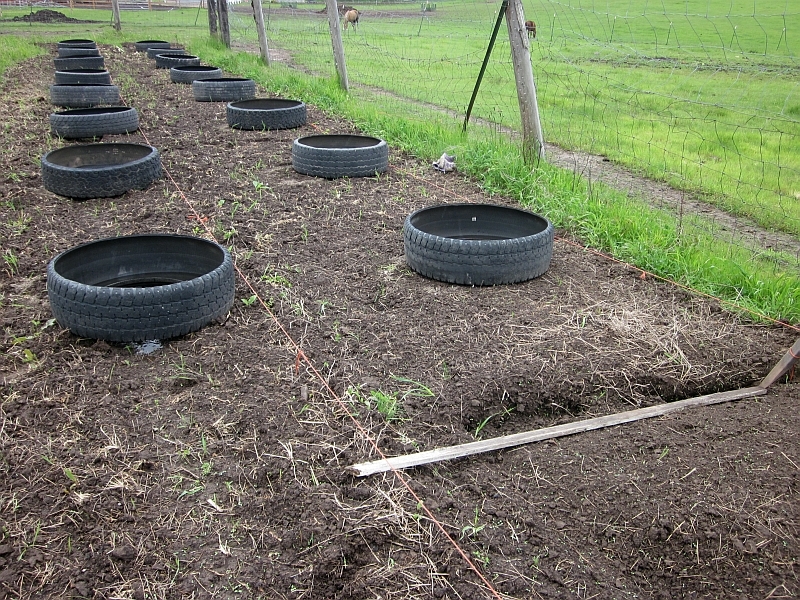 problems, though previously you had stated that the tires wouldn't leach material for the plants. I am also not sure about cleaning, but it is a pretty good bet they won't rust. 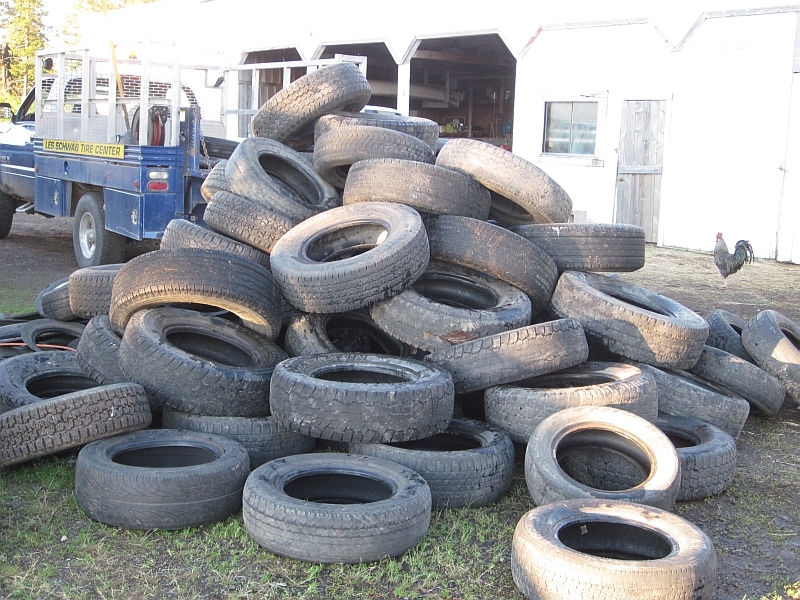 Oh my that's a lot of tires! 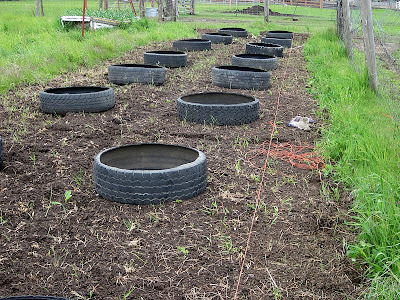 Praying that this will help solve your gardening woes and that you'll have a great harvest for all your hard work! Holly tire!!!!! 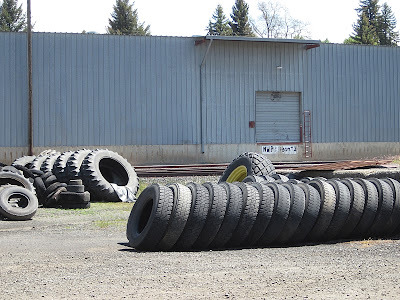 Wow, you have plenty of tires to last for sometime. 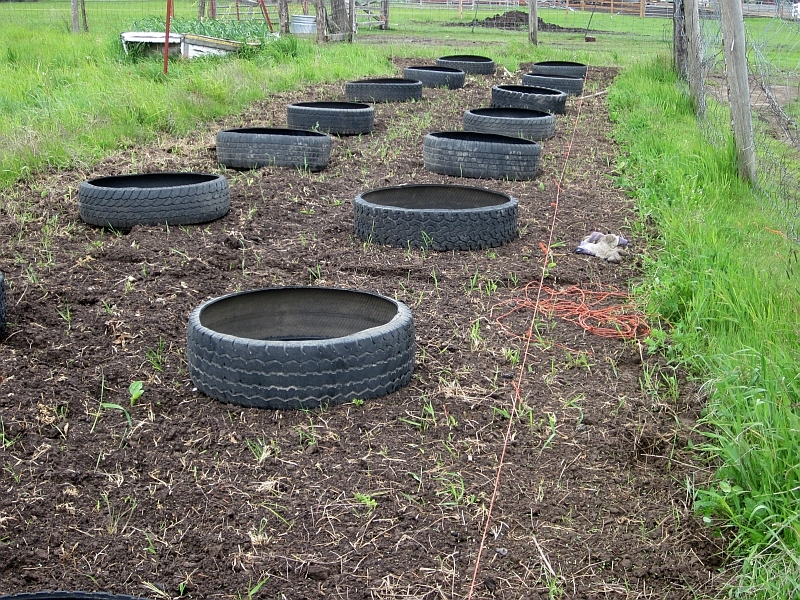 Next year, I plan on using tires as part of my potato garden. 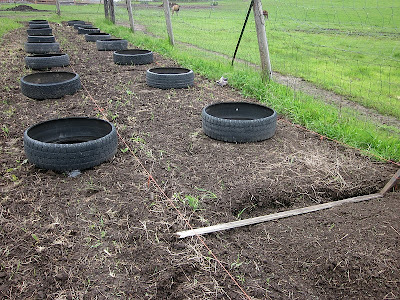 It will look so awesome with all the wonderful veggies growing. We used wine barrels and it looks great. I wish I had the room you have. I only have twelve barrel halves. Everything is growing very well. I wish you the best! One use I have made of the tire sidewalls is to throw them on the ground to keep stacked firewood off the ground. Works like a charm. 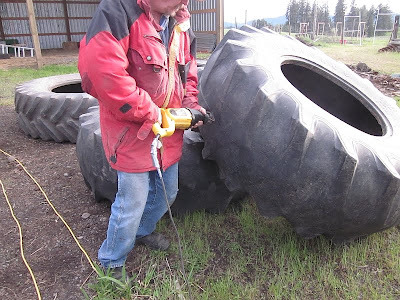 You can cut them with a reciprocating saw (as shown in your photo), but I have seen where people used a thin blade grinder. I imagine it is a matter of preference. We actually asked that of our friend Jack. 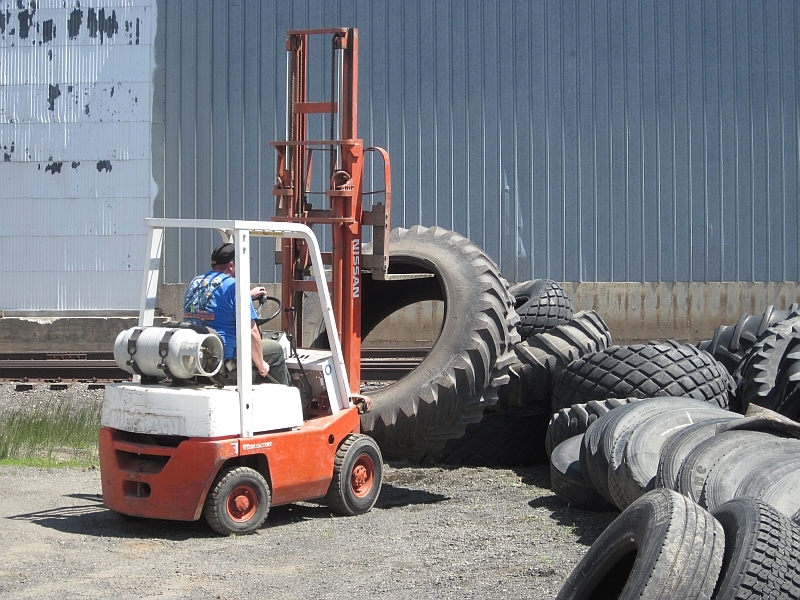 He pointed out tires that had a wonderful tread were flawed because they were separating. Once he pointed out the separations, we saw a lot of it. Good ideas! I might have to try this with my herb garden. 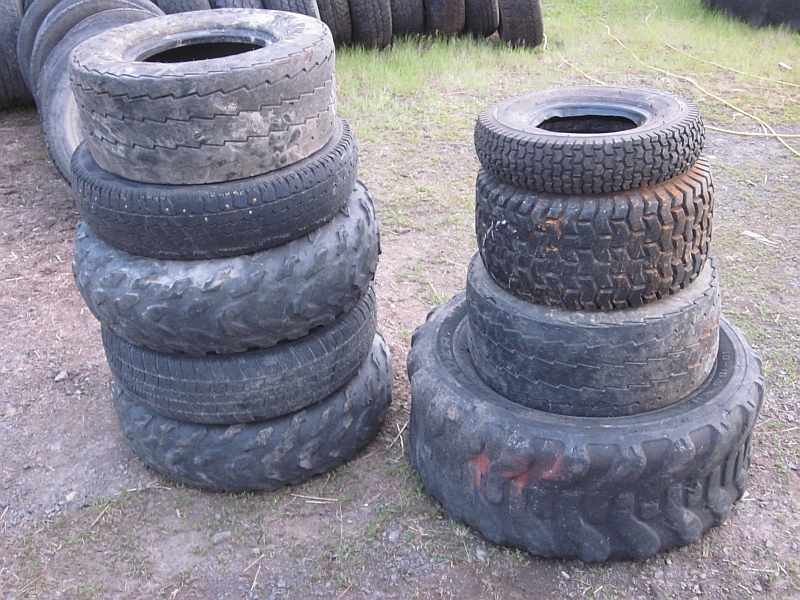 I use tires as well. I also get people thinking I am crazy. I use them for toys for my kids, and my goats. I use them for gardening. I cut the sidewalls out, cut the tread in half and then WHAM, rubber siding for buildings. 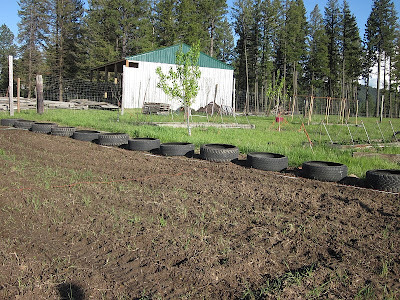 The sidewalls I use as edging around trees. Put the sidewall around the tree, fill with rock. Bam. Easy. 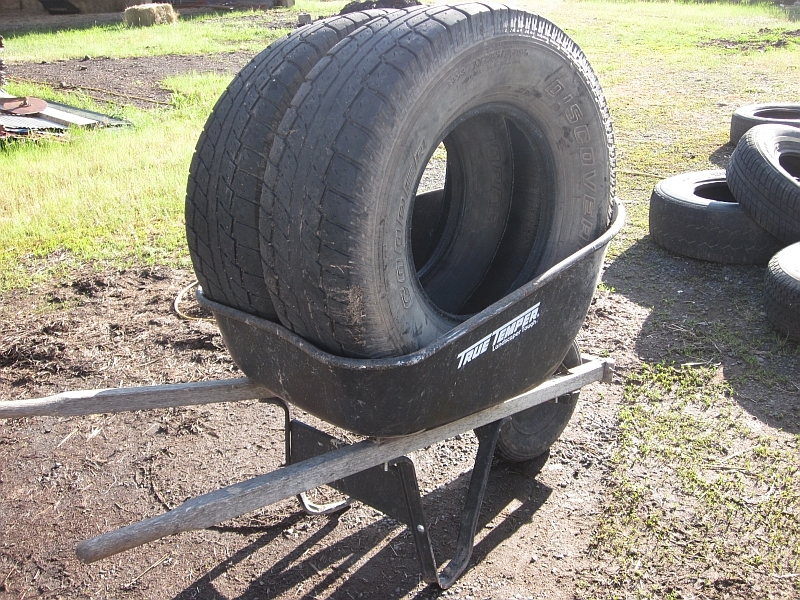 Love tires, so versatile!